This video was made at the Honda Collection Hall, as they occasionally bring cool small bikes out for a zip around the courtyard for fans to see. I love watching these videos, because they are so calming and simple. It’s just a guy riding a little bike around a short brick path. No music, no words, just bike. How it should be. 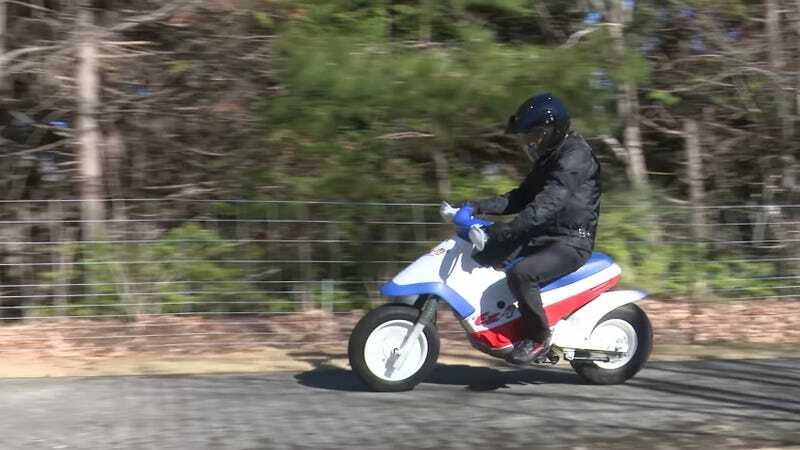 Honda’s plan with the EZ-9 Cub was to get people into two-wheel riding that weren’t already excited about it. This was meant to be an accessible ride for every member of the family. The brief on the bike says Honda had three keys to keep in mind when designing the EZ-9, friendly looks, easy to ride, and fun to ride. It’s fair to say the EZ-9 Cub never caught on the same way the original Cub did. Largely due to its small size, Toys-R-Us looks, and non-street-legal status, there aren’t many of these EZ-9s around anymore. Only those properly dedicated to the Cub Cause have them. And IndyCar drivers. You’ll probably know the EZ-9 Cub if you’re an IndyCar fan, as the entire paddock used these as pit bikes for years. It is my understanding that when Honda was the lone engine supplier to IndyCar from 2006 to 2011, it provided teams with these small, lightweight, and reliable bikes to tool around the paddock with. Many of those teams, including Andretti Autosport, still use the Cubs.